Warning government employees to ‘‘desist from RSS related activities’’ in government institutions Chief Minister Virbhadra Singh today said the services of those found guilty of this would be terminated. With the Central empowered committee directing the Himachal government to provide exact data about the availability of private timber exact assessment of the tree cover outside forests will be made for the first time in the hill state. Hearing impaired have not been receiving due attention because of lack of awareness about the disability and failure to identify such persons early, according to Dr Mallikarjun, president of the Indian Speech and Hearing Association. This temple and historical town’s dream came true in 2000 when a Rs 1 crore auditorium was dedicated to the public. But the auditorium is in a dilapidated condition due to official and government apathy. Accusing Punjab of impinging on the rights of its neighbouring states, the BJP today said it would extend full support to the Congress government in Himachal on the issue of getting the state’s due from Punjab. The delay in commissioning the 126 -MW Larji project will cause a revenue loss of over Rs 45 crore to the state electricity board during the current financial year. Situated at a height of 13,000 feet, the Krishna temple here offers an inimitable place for religious tourists. It is a five-hour trek from Tapri to the temple. Devotees throng the Krishna temple at Yula Kanda in Kinnaur district to celebrate Janmashtami on Wednesday. The BJP spokesperson, Mr Randhir Sharma, today said that keeping in view the steep price rise, an increase of Rs 5 in the daily wages was an insult to the workers. Bathu bridge which collapsed on August 4 on the Kangra- Shimla highway was today thrown open to pedestrians as reconstruction work on it completed yesterday. The CPM today criticised the government’s decision of promulgating Section 144 of the CrPC in Himachal Pradesh University (HPU). A 20-year-old tourist from Phagwara, Mohit Kumar, died here today after slipping into the Bhagsu waterfall. Property worth lakhs of rupees was gutted in two fire incidents in the district, the police said today. Twelve Manimahesh pilgrims were killed when their vehicle veered off the road and fell into the Ravi near Choori on the Chamba-Bharmour highway, 25 km from here, last night. 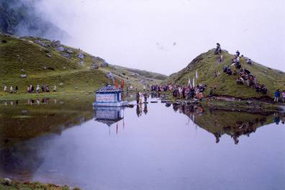 Over one lakh devotees have visited the Manimahesh till today. He was addressing a gathering at Devthal village near Subathu today after offering prayers at the ancient shrine of Brijeshwar Mahadev. He later addressed a public meeting at Kunihaar where he said budget worth Rs 500 crore had been set aside for the maintenance of traditional water resources. He laid stress on water harvesting and said it had been made mandatory for all buildings. He later dedicated a community centre constructed at a cost of Rs 25 lakh to the people of the area. Chief Minister said he was according top priority to the grievances of the people. While lauding the efforts of the Nehru-Gandhi family in granting statehood to Himachal he said the state had progressed immensely under successive Congress governments. He said Himachal had established a name for itself in various fields, including education, social welfare, health infrastructure, law and order, road network, etc. All census villages had been electrified in the state and system implementation was under implementation to provide consumer quality power supply. Chief Minister later listened to public grievances at Kunihaar and passed necessary directions for providing relief to the aggrieved persons. Conceding the demands of the local people he announced upgradation of the local Public Health Centre into a Community Health Centre. The MP, Mr D.R Shandil, who was also present on the occasion said the National Rural Employment Guarantee Scheme was playing a crucial role in the uplift of the rural poor. So far the Forest Survey of India(FSI) has only been providing reports on the status of forests on government land every two years. Massive felling of trees on private land has taken place over the years but no steps could be taken to check it for want of authentic data. The state forest department has now sought the services of the FSI for the purpose. It has requested the FSI, which has been compiling reports about the forest cover every two years, to assess the status of tree cover on private land on the basis of satellite images. Unlike Uttaranchal, Gujarat and some other states the government had not made any effort to assess the tree cover on private land and compile data necessary to ascertain the capacity to sustain forest-based industry. The committee had sought the data in connection with the matter pertaining to the closure of 450 unregistered saw-mills in the state on the order of the Supreme Court. Sawmills had been set up in areas where hardly any private timber is available and it is common knowledge that they mostly saw trees felled illegally from government forests. For instance, the Hamirpur district has the maximum number of 319 unregistered saw mills. The department has urged the FSI to give a detailed report in six months. However, sources said that it would take much time as data regarding the growing tree stock had to be evaluated species-wise and district-wise. The Forest Department had supported the case of the sawmill owners before the committee and stated that they worked private timber and the trees allotted to right holders under the TD (timber distribution) rules. However, the state already has over 3,000 registered sawmills and with a complete ban on green felling there is little justification for such a large number of units. It was for this reason that the empowered committee asked the government to provide detailed data about the growing tree stock outside the forest area. Speaking at the conclusion of the three-day festival of hearing organised by ALPS International, a leading hearing health company, last evening, he said unlike the blind persons who could be easily identified and attracted sympathy of the society, the persons with impaired hearing were ridiculed. They were not treated like disabled and evoked little sympathy. He said there was an urgent need to create awareness about hearing disability so that those suffering from it could be properly treated and brought into the mainstream. The congregation underlined the need for a close interaction of the hearing. Dr Narane, who recently received the national award for deaf technical innovation said the new digital solution like DH power and sixth sense would be able to give increased practical benefits to the hearing impaired patients even in difficult and noisy listening situations. Dr Rajesh Patodia from Hinduja Hospital, Mumbai, highlighted the importance of cochlear implant in rehabilitating the hearing impaired children. The company has launched the world’s first 128-channel noise controlling hearing aid sixth sense, which has the facility of blue tooth connectivity. This town had been craving for an auditorium or a multi-purpose hall, in view of the increase in the number of institutions which included a Polytechnic College, Medical College, MCM DAV College, oilseed station and Krishi Vigyan Kendra under CSK Agriculture University, Palampur. Other socio-cultural organisations too were in need of an auditorium to hold seminars, cultural and other programs. An auditorium costing Rs 1 crore with a seating capacity of 500, the first of its kind in this district, was constructed on the Polytechnic College premises. The auditorium was completed in a record time of one and a half years and was inaugurated in 2000. The auditorium building is a complete stone structure, spread over 850 square metres with 24 mt x 14mt central hall 8.6 m in height. The hall has a GYP board ceiling with echo absorbent ‘acoustical treatment’ and is soundproof. The hall has iron –nite floornil flooring and Kota stone has been laid in rest of the flooring of the building. The 14mt x 10mt stage has parquet wood block flooring. The auditorium has two separate greenrooms for men and women with attached toilets. It has a balcony and the hall has a special lighting system brought from Holland. It is equipped with a special sound system with most modern technology and has entrances from all the three sides. Unfortunately, it was left uncared for by the authorities for want of funds. The main hall is leaking every where. The rainwater gets accumulated on the roof channels following blockage by the dry leaves which is flowing along with the echo absorbent boards and reach the floor. The GYP board ceiling has got damaged badly, cracked and damaged walls of the building prick the heart of the local people. The water after leaking flows in the gallery and the floor of the hall which look flooded. The participants of a spiritual discourse organised by Vivekananda Kendra had to remove the drenched matting after every shower. Intellectuals and the senior residents of the town expressed resentment over the dilapidated condition of this public property and demanded intervention of the Chief Minister to protect this asset of the town. The Principal of the Polytechnic College, Mr H.K.Bhatti, told The Tribune that the college had no funds for the maintenance of this auditorium. He said that income generated by this hall was being deposited under government head so the money for the maintenance of this hall could not be taken out from that head. He said that during the annual function of the college, local MLA and Chairman Backward Classes Financial Corporation. Surender Kaku announced Rs 1 lakh for the maintenance of the auditorium but the money had not been received by the college as yet. Director of Technical Education K.R.Bharti told The Tribune that he would look into the matter and appropriate steps would be taken to maintain the auditorium. In a statement issued here today, the state BJP spokesperson and sitting MLA, Dr Rajiv Bindal, said the Congress government had failed to protect the rights of the state. “Despite so many years Himachal has not got its share in the power projects, 7.19 per cent share in Chandigarh and possession of the Jogindernagar power house,” he said. He said that under the Punjab Reorganisation Act, Himachal was to get 7.19 per cent share but till date not a single unit of power or water had been given in the Bhakra, Pong and Ranjit Sagar dams. Dr Bindal said thousands of families from these areas had been rendered homeless, but no benefit given to Himachal. He said the BJP had always fought for protecting the interests of the state and the royalty issue was also raised by it. He lamented that the Congress had never taken up the issue seriously and was talking about getting the rights of the state only to impress the people. The first unit of the project ,which is already 40 months behind schedule, is likely to be made operational in the last week of August. The high voltage testing equipment has finally reached the project site and the tests of first unit will be completed by August 20. The second unit will be made functional subsequently. The delay is a result of poor planning. The equipment should have reached the site in May, when the project was scheduled to be commissioned. The failure of the board to commission the project by May 31 as per the revised schedule will result in the shortfall of generation to the tune of 150 million units. The project will generate 586 million units in a year against the projected generation of 400 million units . The total generation from the project is not likely to exceed 250 million units. A shortfall of 150 million units will cost the board Rs 45 crore. It has been indeed the most expensive project to date, with cost escalating from the approved Rs 640 crore (at the 1999 price level) to Rs 1221 crore. On completion the cost was likely to be over Rs 1250 crore. The per megawatt cost comes to about Rs 10 crore as against Rs 5.50 crore in case of the Nathpa -Jhakri project ,which has also been executed by a public sector undertaking. Every year on Janmashtami, hundreds of tribals from Yula and its surrounding villages visit the temple to celebrate the festival. There was a huge gathering in the temple today. The District Magistrate of Kinnaur, Dr Amandeep Garg, was invited to attend the function. It is believed that on Janmashtami the pilgrims after offering prayers in this temple head for the Kinner Kailash yatra. Another local belief associated with the festival is that from this auspicious day the harvesting season begins. In a statement issued here, he said the pace at which the prices of all essential commodities had gone up during the past two years, an increase of Rs 5 was like making fun of the workers. He said with most of the industrial belts located in the border areas of the state, youth going there for work from other parts were unable to meet their expenses with a daily wage of Rs 75. Mr Sharma said the Chief Minister, Mr Virbhadra Singh, did not utter a single word on the issue of corruption in his Independence Day speech. This showed that it was no longer an issue for the Congress whose rule had been marked by scams. Mr S.K. Nag, Executive Engineer, National Highway, said today that the pedestrians, who were crossing Bathu khud by the railway track, were allowed to cross the khud through the reconstructed bridge. He said on August 18 light vehicles would be allowed to cross the bridge and on August 25 buses would be allowed on the bridge. Heavy trucks would be allowed to cross the bridge from August 31. Meanwhile National Highway No 88 connecting the Kangra valley with the rest of the country remained closed for the fourth day on Wednesday following a landslide at Banner on the outskirts of Kangra town. In a statement issued here, the state secretariat member, Mr Tikender Singh Panwar, said the clamping of Section 144 amounted to creating an emergency-like situation where students did not have the freedom to debate various issues at the time of elections. “This has probably been done by the government as it is aware of the anti-government mood among the students,” he remarked. Mr Panwar said the students would give a befitting reply to such repressive policies of the government and elect the best representatives who would fight for their cause. “The student community has fought against the question paper scam during the BJP regime and the latest HP-CPMT paper scam, so they know how to fight against such government policies,” said the CPM leader. According to the police, Mohit had come here with three other friends, Palwinder, Rohit and Adarsh, yesterday. They were reportedly taking pictures when the deceased slipped down the slope into the water stream. The police had a tough time locating the body and it could found only around 5 p.m. A case has been registered under Section 174, CrPC. A three-storey building, housing many government offices, was reduced to ashes in a fierce fire caused by leakage in an LPG cylinder at Jubbal, 90 km from here. Twentythree shops housed in the building and the residence of the owner were also gutted. The exact loss was yet to be ascertained, but it was estimated to be worth lakhs. An official said 11 persons were killed on the spot while an eight-year-old girl died at Zonal Hospital here today. The district authorities rushed to the accident site last night and extricated 11 bodies from the river. Only four victims have so far been identified. They are Vinod Kumar a resident of Chabootra village, Sushil Kumar, Jhaniara village, Shammi Jagota of Partap Gali, Hamirpur and Vinod of Budha village near Baddi in Solan district. Meanwhile the authorities are waiting for the kin of the deceased to arrive and identify the bodies. Informally, the Manimahesh pilgrimage started today and will conclude on September 1.